Stonehenge is a prehistoric, mysterious circle of upright stones in southern England. Construction on the great monument began 5,000 years ago; the famous stones that still stand today were put in place about 4,000 years ago. The great age, massive scale and mysterious purpose of Stonehenge draw over 800,000 visitors per year, and several thousand gather on the summer solstice to watch the sunrise at this ancient and mystical site. The stones are aligned almost perfectly with the sunrise on the summer solstice, and it is almost unquestioned that Stonehenge was built as a spectacular place of worship. Although the faith of the Stonehenge builders predates any known religion, the site has become a place of pilgrimage and worship for Neopagans who identify themselves with the Druids or other forms of Celtic paganism. It is also popular with New Age devotees, who report powerful energies at the site. The current site, awe-inspiring as it is, is only part of the original Stonehenge. The original construction has suffered a great deal from both weather damage and human pillage of its rock over the millenia. Stonehenge has been the subject of much archaeological and scientific inquiry and research, especially in the last century. The modern account of the construction of Stonehenge is based primarily on excavations done since 1919 and especially since 1950. Archaeologists believe the construction of the site was carried out in three main stages, which have been labeled Stonehenge I, Stonehenge II and Stonehenge III. The native Neolithic people of England began construction of Stonehenge I by digging a circular ditch using deer antlers as picks. The circle is 320 feet in diameter, and the ditch itself was 20 feet wide and 7 feet deep. Next, they used the chalky rubble taken from the ditch to built a steep bank circle just inside the outer circle. Inside the bank circle, they dug 56 shallow holes known as the Aubrey holes (named after their discoverer, 17th century scholar John Aubrey). Finally, two parallel stones were erected at the entrance to the circle, one of which, the Slaughter Stone, still survives. Also surviving are two Station Stones, positioned across from each other on opposite sides of the circle, which may also have been erected during this time. Stonehenge I seems to have been used for about 500 years and then abandoned. 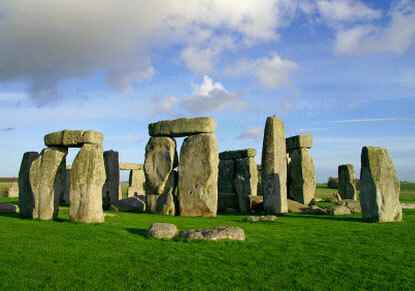 Construction of Stonehenge II began around 2100 BC. In this phase, a semicircle of granite stones known as bluestones (from their original coloring) was assembled within the original bank and ditch circles. Several aspects of this phase are intriguing. First, the bluestones come from the Preseli Mountains in South Wales, nearly 250 miles away. There were about 80 of them, weighing up to 4 tons each. How they were transported is not known, although scholars don't regard the feat as impossible and various theories have been presented. It is intriguing to wonder, however, what makes the Stonehenge site so special that so much effort would be expended to drag the giant stones 250 miles instead of constructing the monument near the quarry. Second, the entranceway to the semicircle of bluestones is aligned with the midsummer sunrise. The alignment was continued by the clearing of a new approach to the site, "The Avenue," which has ditches and banks on either side like the original outer circle. Two Heel Stones (so-named from the shape of the one that remains) were placed on the Avenue a short distance from the circle (and, today, very close to Highway A344). Stonehenge III is the stone circle that is still visible today. During this phase, which was started in about 2000 BC, the builders constructed a circle of upright sarsen stones, each pair of which was topped with a stone lintel (horizontal capstone). The lintels are curved to create a complete circle on top. There were originally 30 upright stones; 17 of these still stand. These stones came from the Marlborough Downs, 20 miles to the north, are 7 feet tall and weigh 50 tons each. The outside surfaces of all these stones were pounded smooth with hammers, and dovetail joints fasten the lintels to their uprights. Within this stone ring was erected a horseshoe formation of the same construction, using 10 upright stones. Here the trilithons (set of two uprights plus the lintel) stand separated from one another, in 5 pairs. Eight of the original ten stones remain. The horseshoe shape opens directly towards the Slaughter Stone and down the Avenue, aligned with the summer solstice sunrise. About a century later, about 20 bluestones gathered from Stonehenge II were placed in a horseshoe shape inside the sarsen horseshoe. Less than half of these remain. Some shuffling around of the bluestones and digging of holes (probably in preparation for placing the bluestones, which was not completed) occurred around 1500 BC. The Altar Stone is the biggest of these newly-arranged bluestones that remains. Around 1100 BC, the Avenue was extended all the way to the River Avon (over 9,000 feet from Stonehenge), indicating that the site was still in use at that time. Stonehenge stands in a grassy field in the Wiltshire countryside, and must have been a highly atmospheric site over the millennia since its construction. Unfortunately, in modern times the site has lost a great deal of this atmosphere, thanks to the intersection of two major highways nearby and the inevitable tourist infrastructure. In this regard, Avebury is far superior to Stonehenge. That said, Stonehenge is such a magnificent monument that it would impress no matter where it is. The astonishing scale and beauty of the stones, the great care and labor in construction, and the mystery that surrounds its original purpose are just some of the reasons Stonehenge is one of the most popular sights in England. And under stormy skies, a fresh snowfall, a rainbow, a full moon, or the rising sun on the summer solstice, it is a mystical site indeed. A visit to Stonehenge begins across the highway from the monument, at the large and efficiently-run Visitor's Centre. There is a fee for parking as well as for admission, which includes an optional audio guide. A pedestrian passageway leads under the highway to Stonehenge itself, where a designated path allows for views from all sides. 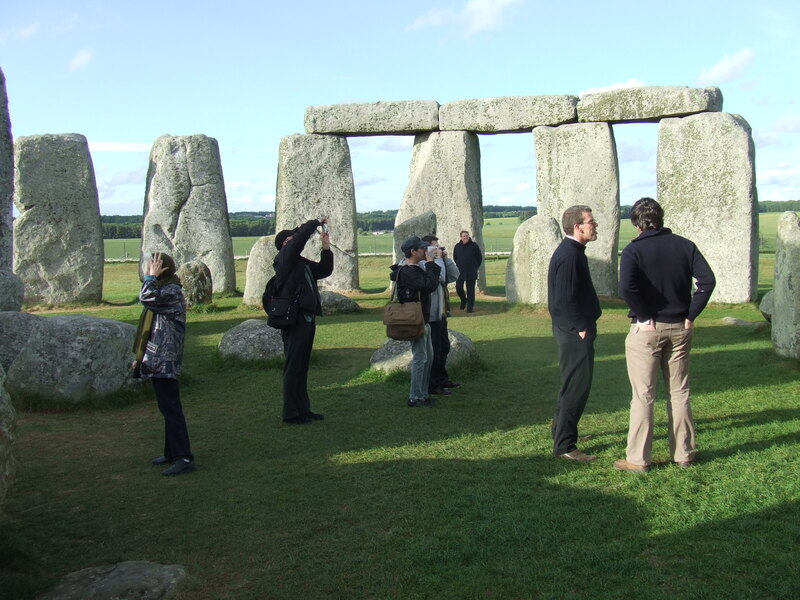 For conservation reasons, visitors are no longer allowed to approach the stones except on the summer solstice, but access can be arranged by appointment or on a special tour.